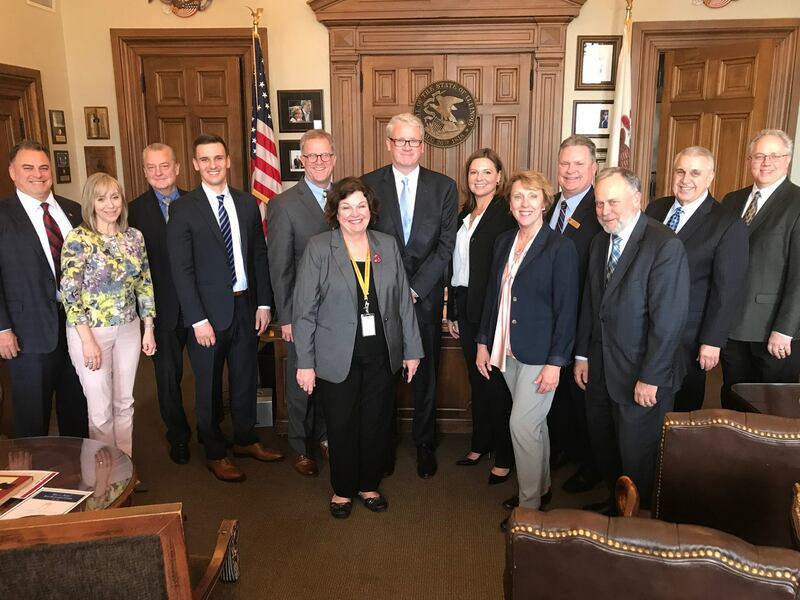 State Representative Jim Durkin met with the DuPage County Board this week when they visited Springfield to discuss issues impacting their communities. Tax Foundation finds Pritzker tax proposal would have devastating effect on Illinois economy. Illinois, which is already one of the highest-taxed states in the nation in terms of sales taxes and local property taxes, would add income taxes to this dismal list of rankings. Under Gov. Pritzker’s proposed Illinois tax rates on individual and corporate income – rates that could be subject to revision – corporate income would be taxed at 10.45%, the third-highest rate among the 50 states. Pass-through business income used by a wide variety of farmers and small businesses would be taxed at 9.45%, the fourth-highest rate for pass-through small-business income among the 50 states. The Tax Foundation’s publication of the true tax rates to be charged under the Pritzker plan reflects one of the levels of skullduggery indulged in by the plan’s proponents. Under existing Illinois income tax law there is a substantial “hidden” income tax on businesses called the “personal property replacement tax.” This is a supplemental tax created in the early 1970s by the Illinois General Assembly after a former, pre-1970 tax, the personal property tax, was abolished by law. The Constitution of 1970 forbade the State from charging and collecting a tax on personal property, and ordered Illinois to phase it out. Of course everyone collecting the old tax continued to need the money, so the General Assembly enacted a personal property replacement tax on business income and ordered that it be slapped onto all business income tax filings and payments as a hidden supplement. Supporters of Gov. Pritzker proposal have so far ignored the existence of the personal property replacement tax and have tried to publicize tax rates that continue to hide the tax, but the Tax Foundation has ceased to play this game and has chosen to publish a new, corrected tax table that includes the full cost of the tax proposal. Under Pritzker’s plan, Illinois job creators would have to pay: (a) all of their existing income taxes, whether corporate or pass-through as individual taxpayers; (b) all of the tax increase included in the Pritzker proposal; and (c) the “hidden” personal property replacement tax. Under the Pritzker plan, Illinois’ tax status would drop, in the eyes of the Tax Foundation, to 48thof the 50 states. General Assembly passes bill to raise minimum age to purchase tobacco from 18 to 21. House Bill 345 also covers nicotine-vaping products such as e-cigarettes. Supporters pointed to soaring vaping rates among younger Illinoisans and the continuing danger of nicotine addiction and exposure to cigarette smoke. In House floor discussion of the measure, supporters shared stories of their own concerns with cigarettes and nicotine. Some House members expressed their opposition to the measure, pointing to the fact that 18-year-olds are legally allowed to vote and enlist in the U.S. armed forces. In addition, the bill decriminalizes possession of tobacco products for minors. Reducing the sale of tobacco products will also reduce Illinois tax revenues. Tobacco taxes are a significant piece of the State’s overall budget picture, and the measure could reduce Springfield’ tax intake by up to $40 million/year. However, the House passed HB 345 on Tuesday, March 12, by a vote of 82-31-0. After the Senate passed the bill on Thursday, March 14, by a vote of 39-16-1, the measure was cleared for transmittal to the Governor and signing into law. “Lincoln Yards” development moves through Chicago City Council. The significant-sized development will adaptively re-use Clybourn Avenue space formerly oriented towards railroad sidings, truck parking lots, light-industry buildings and a steel mill as a high-value urban footprint. Developer Sterling Bay says the name “Lincoln Yards” celebrates the site’s location between the neighborhoods of Lincoln Park and Bucktown. The development will occupy a large slice of Chicago’s North Side centering on the site of the former A. Finkl steel mill. Sterling Bay and its chief ally, retiring Chicago mayor Rahm Emanuel, says the $5 billion development will create 10,000 construction jobs, 24,000 permanent jobs, and 21 acres of parkland. Many of these new jobs would be specialized professional working positions rather than the industrial jobs on which Chicago once based its economy. Critics say the site occupies a stretch of irreplaceable Chicago River waterfront. Illinois State Museum receives highest national recognition. The Illinois State Museum has again achieved accreditation by the American Alliance of Museums, the highest national recognition afforded the nation’s museums. Accreditation signifies excellence to the museum community, to governments, funders, outside agencies, and to the museum-going public. The Illinois State Museum has been accredited since 1972. All museums must undergo a reaccreditation review at least every 10 years to maintain accredited status. More college students leaving Illinois to study in other states.Figures gathered by the Illinois Board of Higher Education (IBHE) show a high percentage of Illinois public high school graduates are moving on to four-year institutions, but of the graduates who have progressed on to four-year colleges, 48.4% are studying at out-of-state institutions. January 2019 unemployment up in many metro areas. The year-over-year trends were negative in thirteen separate Illinois metropolitan areas. While some of these areas were successful in creating new jobs, local increases in the numbers of people looking for jobs outweighed the number of jobs created. Metro areaswith higher unemployment rates in January 2019 than had been posted in January 2018 included Bloomington-Normal, Carbondale, Champaign-Urbana, Lake County, Peoria, Springfield, and the Metro-East region of greater St. Louis. In four metro areas – Decatur, Elgin, Kankakee, and Rockford – Illinois unemployment rates were more than one full percentage point higher in January 2019 than they had been in January 2018. Illinois to celebrate St. Patrick’s Day on March 16-17. The unofficial holiday and parade day has moved from an observance of Illinois’ Irish-American heritage to a celebration of all ethnic backgrounds. The color is Kelly Green, though, and clovers, tinted water and bowler hats are the watchwords of the day. The city of Chicago’s longtime tradition of adding green vegetable dye to the Chicago River has made the City of the Big Shoulders the unofficial national capital of St. Patrick’s Day. Parades and festivals can be found all over Illinois. Illinois’ Irish-American heritage has spread throughout Illinois ever since the digging years of the Illinois and Michigan Canal of the 1830s, the infrastructure project that was one of the new state of Illinois’ first big achievements that brought our state recognition on a national platform. Much of the huge project was built by Irish-American workers, including refugees who had fled brutal conditions in what was then a colonial-occupied homeland. Canal centers include not only Chicago at the waterway’s northeastern end, but also La Salle-Peru at the southwestern end and Joliet in the middle. Joliet, La Salle-Peru, and many other Illinois communities will join Chicago to celebrate St. Patrick’s Day this weekend. Law enforcement has announced their intent to strictly enforce safe-driving laws throughout Illinois this weekend. The Illinois Department of Transportation urges St. Patrick’s Day celebrants to designate a safe driver.